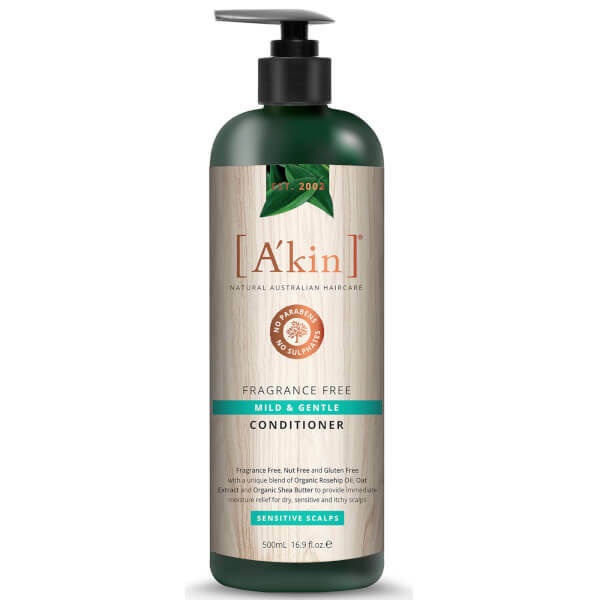 Developed for a sensitive scalp, the A'Kin Mild & Gentle Fragrance Free Conditioner provides immediate moisture relief for long-lasting comfort. Enriched with Oat Extract, Shea Butter and Certified Organic Rosehip Oil, the natural formula soothes and nourishes an itchy scalp, whilst helping to minimise flaking caused by dryness. The comforting conditioner helps to calm and relieve the scalp without stripping the hair's moisture. After shampooing, massage into wet hair and scalp. For best results, leave for up to 5 minutes and rinse thoroughly. *Botanical sources. +Certified organic. #GMO free.